Last week’s blog installment was all about random thoughts, because that’s what I do when there’s no big news or central theme on any given week. When I woke up this morning my first thought was “Man it’s early” and my second thought was “Well, there’s two boyz snuggling with me so maybe another hour’s sleep would be OK.” Then my third thought was “It’s Thursday. What am I going to write about?” Finally, my fourth thought just popped into my head for no reason. It was, “I’m going to write about unforgettable moments in my life.” So there. I don’t know if it’s just me or if everyone has a cache of truly unforgettable moments stored in their memories. And I don’t mean stuff that you just remember generally. For me, there are literally millions of those memories, but there are some others that are etched so deeply into my brain that I can still close my eyes and be there. I can feel it. I can sense it. I can get the same goosebumps now as I did then. It’s amazing. So today, I will be doing a little of the “random thing” because I’m just picking a few unforgettable memories out of hundreds that I would rank as the “best of the best” and the most memorable. These are also in no particular order, because any memory in this grouping would have to be tied for first place. They’re all that special. OK, actually there is one photo that gets put at the top. In “Bats, Balls, & Burnouts” this photo is tagged with the line “Just a couple of kids on Maui” and there’s no debating that we look very young. Truth is, though, I was 41. I just still looked really young. And yes, from my current perspective as a 62-year-old “kid” 41 was really young. I’ve grown a lot since then. I remember everything about the day. December 31, 1997. I remember the layout of the condo we stayed in, just a few hundred yards away from this backyard right on the beach. 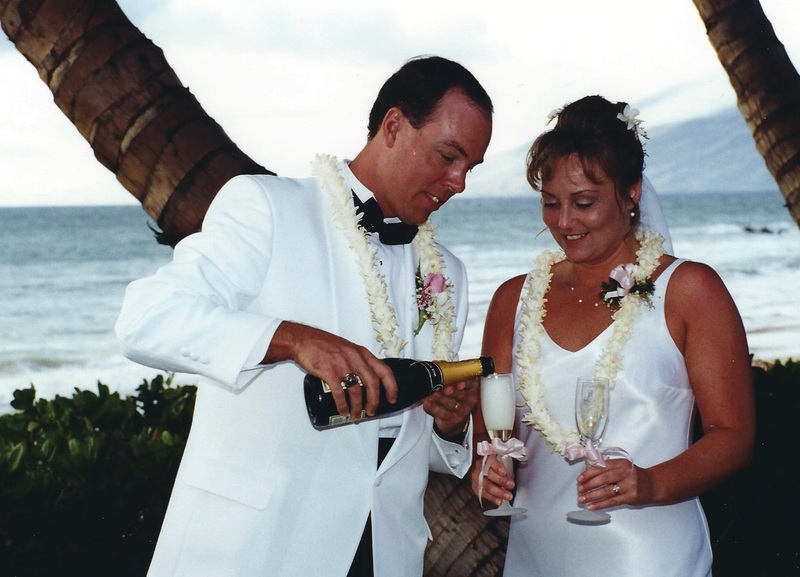 I remember the smell of those leis we wore. I vividly remember how nervous and excited we both were. I remember being horrified that, for most of the day it was dreary and rainy but just before our planned wedding everything dried up and it all went perfectly. And, of course, our sumptuous dinner at the Grand Wailea Resort, sharing a private balcony with Halle Berry and her none-too-pleased boyfriend. These are the sorts of things that I can feel, smell, and remember in crazy detail. As you likely know, I’m a huge music fan and I have a long list of great unforgettable moments that have stayed with me. 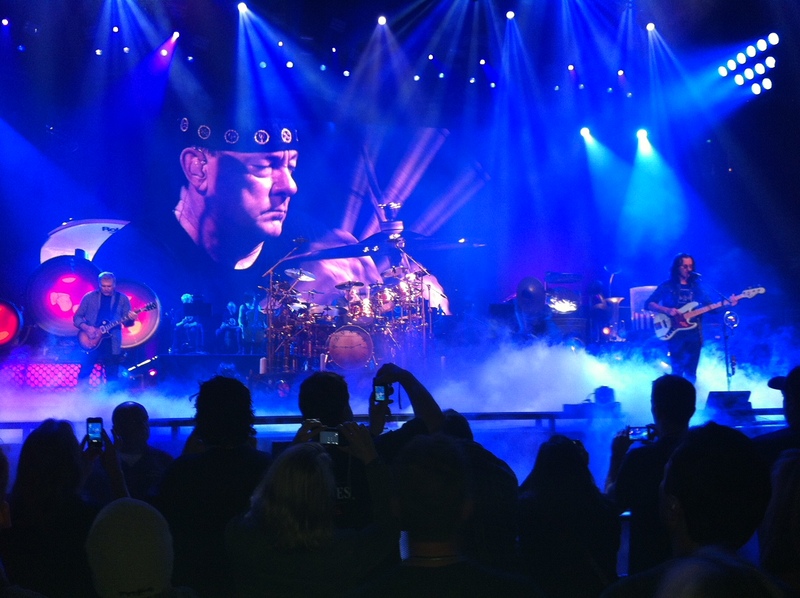 You probably assume the photo of a few of us NHRA guys with Geddy Lee, backstage before a Rush concert in Dallas, would be on this blog. Truth is, it’s not. We were all as nervous as we were excited, and although I do recall the backstage meeting in great detail it is fogged by those nerves. I didn’t want to be “that guy” and say something inappropriate or take up too much of Geddy’s time right before the show. We kind of “Rushed” through the whole thing in a blur. See what I did there? What a way to say goodbye. Best concert ever. We didn’t know at the time if there would ever be another Rush tour. It turned out there was one, but the dates never lined up for me and I wasn’t able to see any of those shows. Probably a good thing. I suspect it would’ve been a little emotional to “say goodbye” to those guys. Still, I had a strange unshakeable feeling in Anaheim that this was it, at least for me and Barbara. With those seats and with that show, it just wouldn’t have gotten any better. 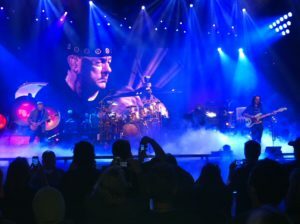 When they played the “Clockwork Angels” album in its entirety during the second set, with a string ensemble behind them, I swear I was transported somewhere. It was the most magical set of music I have ever seen in my life. I have goosebumps just typing this. I remember it so damn vividly. And to cap it off, we defied all mathematical odds by leaving the building with 15,000 other fans and yet we somehow ran right into Jeff and Windy Arend when we exited to the parking lot. I’ll never forget the look on Jeff’s face when he shouted “Best concert ever!” I agreed. And there’s a second musical memory on this list, but it’s quite different than any other. Why? Because at the time it was happening and I was watching, I didn’t fully understand how long the memory of the show would stay with me, in such great detail. I didn’t know much about the band. I didn’t know anything about the full double-album they were going to play that night because it hadn’t even been released yet. I didn’t know that the whole album project was a bizarre “coming of age” story, written by the lead singer. It was all a big mystery to me. It was also one of the greatest things I’ve ever seen and it was the final tour for this group with that lead singer who wrote it all. A year earlier my sister Mary had sent me a cassette tape of a “Live” concert by some group called Genesis. I’d never heard of them, and had never heard any of the songs. After one play, my musical tastes were changed forever. So thankful I went to this show. On November 23, 1974 I was in the early part of my freshman year at Southern Illinois University Edwardsville and the band on that cassette came to St. Louis to play at the Ambassador Theater. We sat in the third row of the balcony. I took a date, and she was a girl I actually didn’t know and never saw again. I kept asking my new college friends if any of them wanted to go and kept hearing “Nah, I don’t think so.” Finally a neighbor in the apartment next to mine said she knew a girl who might want to go. 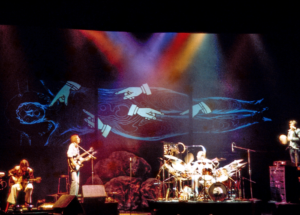 It was a blind date, but I remember the young lady looking at me about 15 minutes into the concert and saying “I have never seen or heard anything like this. They’re incredible!” Mary and her first husband Alan, who had introduced her to the band, hence the mailing of the cassette tape from England, were sitting right in front of us. On our seats were printed copies of the story line for this new album, which I guess was good for pre-show homework but we were all so confused by it the theme kind of refused to stick in my head. What did stick in my head was the amazing playing of Mike Rutherford, Tony Banks, Phil Collins, and Steve Hackett. The lead singer wasn’t bad either. It was the last album and the final tour Peter Gabriel would do with the Genesis. At the time, I didn’t really know any of this. I just knew I’d been grabbed by this strange group and transformed. Not long after the tour, Gabriel left the group to start his solo career. The band stayed together though, and the drummer came out from behind his kit to become the new lead singer. I saw Genesis at least eight or nine more times after this first show, and they were all great concerts. Easily one of the tightest and most precise bands I’ve ever seen. But nothing matches the memory of that first wide-eyed show featuring the entire double LP “The Lamb Lies Down on Broadway.” I still feel so fortunate to have seen it. This next memory is another “feel it, smell it, remember it like it was yesterday” deal. As I wrote about in great detail in my book, the Detroit Tigers released me in June of 1979 and I had to drive home to Kirkwood, Mo. feeling utterly defeated. 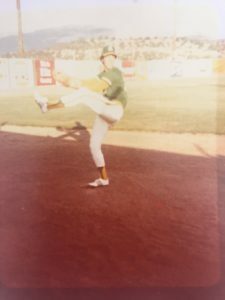 When I got home, my mom delivered the news that the Oakland A’s had called and I needed to do my laundry and get on a plane the next morning. I was headed for Medford, Oregon. 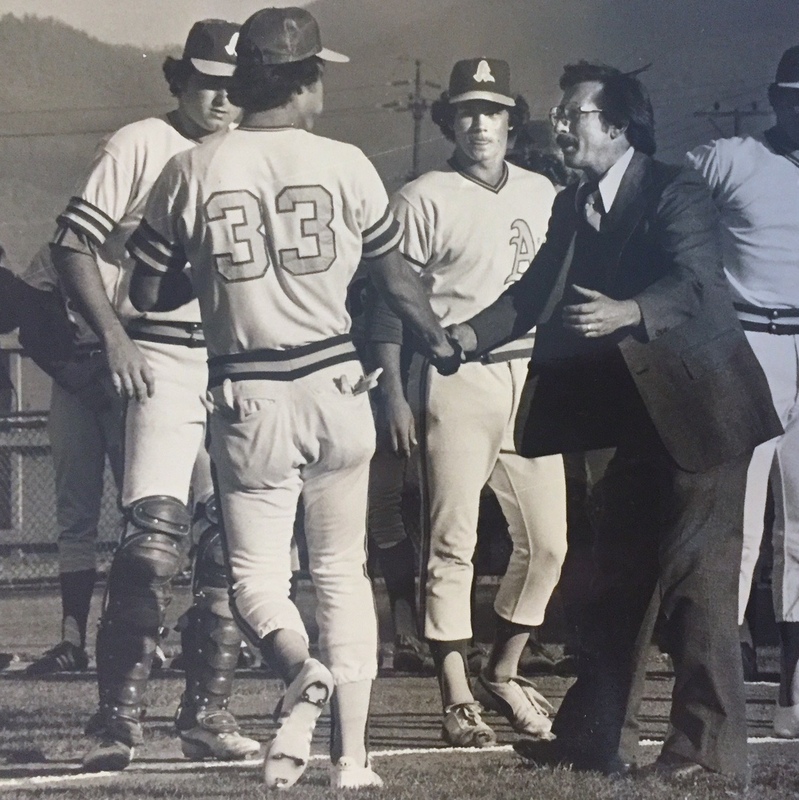 Two days later we were opening our Northwest League season against the Bend Phillies. I’d never been to Medford. I’d never played in the Northwest League. I didn’t know a single one of my new teammates. As I shook hands with the team owner, Doug Emmons, during pregame introductions, my head was swirling. I was the starting left fielder. I was really feeling kind of “out of body” until the first pitch by Mark Tolli hit catcher Frank Kneuer’s mitt. Then it hit me. I’m still a pro. I’m playing the game I love and getting a nominal paycheck for it. I’m a Medford A. Yes, I wore number 33 there. We were lucky to have enough white jerseys to go around for that game. I wore what they gave me. And that’s Frank “Baloosh” Kneuer with the shin guards on, and infielder Shaun Lacey next to him. Both have a look of “Who’s this guy?” on their faces. We all did. And there was another unforgettable moment coming just a week or so later, when teammate Bobby Garrett accidentally let go of his bat and it hit me right below my right eye and across the front of my mouth. That would be one of those bad memories that will never fade. I can still see the bat just inches from my face and still hear it hit me. I didn’t really feel it, but boy did it make a loud sound in my head. By the time I pulled my hand away from my face to see my white batting glove covered in bright red blood, it was a moment I knew I’d never forget because I’d always have visual reminders of that life-changing moment when I would look in any mirror. I’m kind of glad there were no cameras nearby when it happened. This next photo, though, shows the byproduct of the injury. Out of nowhere and with no plan, I “transitioned” into a relief pitcher. 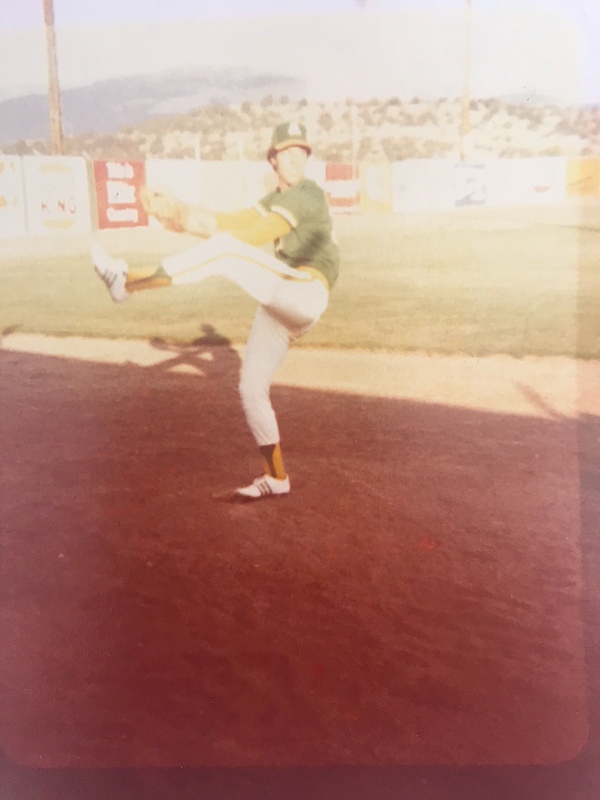 This photo was taken by one of my teammates as I warmed up in the Medford bullpen to go into a game. It’s faded and grainy, taken with a small Kodak Instamatic camera, but I’ve kept it since that late summer day in 1979. The chapters in “Bats, Balls, & Burnouts” that are about playing in Paintsville and Medford are two of my favorites. So many wonderful cherished memories of each of those teams and towns. Turning myself into a relief pitcher, though, is one of those twists and turns in life that come from out of nowhere, but leave you with vivid memories of the entire thing. I was so nervous making my first appearance I was afraid I couldn’t throw a ball near enough to Baloosh for him to get a glove on it. And then it all went better than I could have dreamed, ending with a magical bullpen session in Royals Stadium, with the real Oakland A’s. From shaking Doug Emmons hand, to playing that first game, to the gruesome injury, then pitching with my mom actually in attendance, right down to the feeling of the bullpen mound in Kansas City. I’ve never forgotten any of it. It just happened last year, right? One other baseball memory is the sort that comes from being a fan in the stands, rather than a player on the field. It was the single greatest ballgame I have ever seen, and I’ve seen too many games to count. It was October 6, 2009. Barbara and I had lived in the Twin Cities for seven years. We’d been Twins season tickets holders for six of those years. At the end of the 162-game MLB season, the Twins and the Tigers were tied for first place in the American League Central. The Tigers came to Minneapolis to play the one-game tie-breaker, at the good old Metrodome. Barbara and I felt lucky to nab two seats in almost straight-away center field. 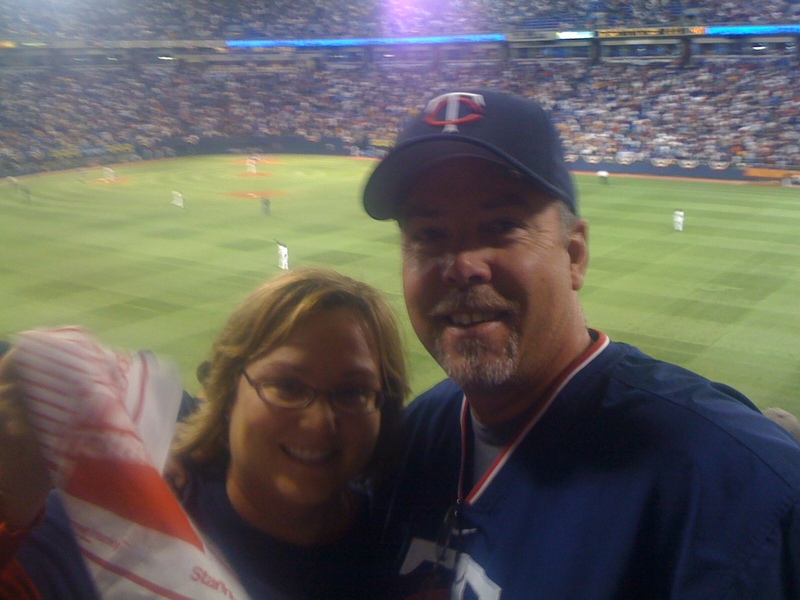 It’s forever known in Twins lore now as “Game 163” and it was the most mind-bending thing. Back and forth lead changes, huge clutch hits, huge mistakes in the field and on the base paths. Each team had numerous chances to put the other away and just as many chances to fold and let it all slip. And because a 163rd game wasn’t enough, it had to go to extra innings. The Tigers took a one-run lead in the top of the 10th. The Twins were facing defeat but managed to tie it up again in the bottom of the inning. The Dome was ELECTRIC. I’ve never felt an atmosphere like that. When Alexi Casilla singled home Carlos Gomez in the bottom of the 12th, I thought four things: 1) This is deafening. 2) That was amazing. 3) The roof might just blow off this place. 4) I’ve never seen a game like this and I’ll never forget it. Single greatest game of baseball I have ever witnessed. And finally, I’ll wrap up this impromptu list (seriously, I had the idea when I woke up but didn’t pick the moments until just before I started typing) with the most important day in my recent life, one which still seems like it happened yesterday and still gives me goosebumps to remember. It was May 20, 2017. It wasn’t that long ago, but it changed everything. 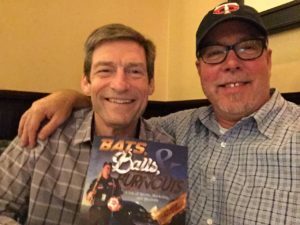 “Bats, Balls, & Burnouts” was due to be released any day. For a week I’d been waking up early to check Amazon only to see the words “Coming Soon” on my sales page. Elon Werner was at the ready with press releases and interviews for me to do. We both kind of figured either the publisher or Amazon would tip us off that it was coming, in like 24 hours or something. Instead, I woke up on May 20 and grabbed my phone like I’d been doing for a week. Not expecting much, I clicked on Amazon. And there it was. I couldn’t believe it. Here are the emotions I felt, pretty much all at once. Fear. Excitement. Shock. Nervousness. And Fear again. It’s one thing to spend a year writing a book about yourself. It’s a whole other thing to see it published and for sale. Fear of failure will grab you by the throat faster than you can process the feeling. The world began spinning very fast right then. It’s still spinning fast. It’s still the most unbelievable and unforgettable thing that’s ever happened to me, and I made it happen. So, I wrote a book. And this Keegan guy is in it. 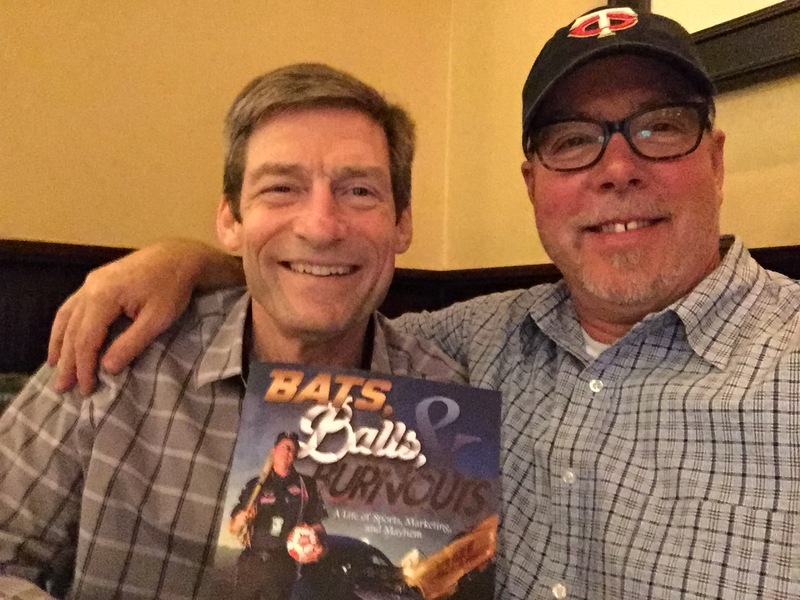 And I’m thrilled to use this photo of me with SIUE classmate Jim Keegan as my illustration for this unforgettable memory. Jim was a big part of the book and a great friend at school. He was fun to go to college with, but more importantly he was a giant part of my education. We pushed each other to be better every day, and had a riot doing it. Thanks for reading this one today. It was enormously fun to write. If you enjoyed even one iota of this blog (whatever an iota is) please do me a small favor and click on the “Like” button at the top. I collect “Likes” the way I used to collect baseball cards. Bob Wilber, at your service and still having goosebumps.